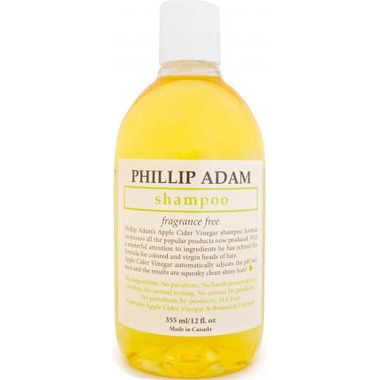 This Fragrance Free Shampoo by Phillip Adam uses Apple Cider Vinegar to surpass all the popular products now produced. With a masterful attention to ingredients, this refined formula is perfect for colored and virgin heads of hair. This shampoo can also double as a body wash for the ultimate clean experience. Using Apple Cider Vinegar, your hair’s ph balance is automatically adjusted for squeaky clean, soft and shiny hair! Ingredients: Purified Water (Aqua), Decyl Glucoside, Ammonium Cocoly Isethionate, Cocamidopropyl Betaine, Apple Cider Vinegar, Caprylhydroxamic Acid & Caprylyl Glycol & Glycerin, Lactic Acid, Hydrolyzed Pea Protein, Chamomilla recutita (Matriarca) Flower Extract, Melissa officinalis Leaf Extract (Lemon Balm), Urtica dioica (Nettle) Extract, Rosmarinus officinalis (Rosemary) Leaf Extract, Salvia officinalis (Sage). Combine this Fragrance Free Shampoo with the Phillip Adam Fragrance Free Conditioner for a complete Fragrance Free wash and rinse! Iâ€™m always looking for fragrance-free product because I have a strong sensitivity to all fragranced product. I find this shampoo very nice and I can use it every day. I also use the conditionner. Not great, my hair felt dry and dull and for the price, I was not impressed. I'm starting to realize that "natural" doesn't necessarily mean better, nor does it mean great results. This shampoo is incredible! FINALLY a fragrance-free, natural shampoo that actually lathers!! I have long, thick hair and I need a nice lather to actually clean all my hair and this provides that while still being gentle. My hair feels great and really clean. I'll definitely be checking out the other Phillip Adam hair products. I have very fine straight hair. Leaves it very shiny, only complaint is a bit more frizz than other shampoos. True to its word, it is odour free. Love the product. I like this shampoo, only need a small about to wash my hair. It seems to clean well but my only complaint is that it leaves my scalp a little dry in the winter.